Time is a funny thing. It went by too quickly while I was in Italy, but it also seemed like an incredibly long time to be away from my hubby and kids. 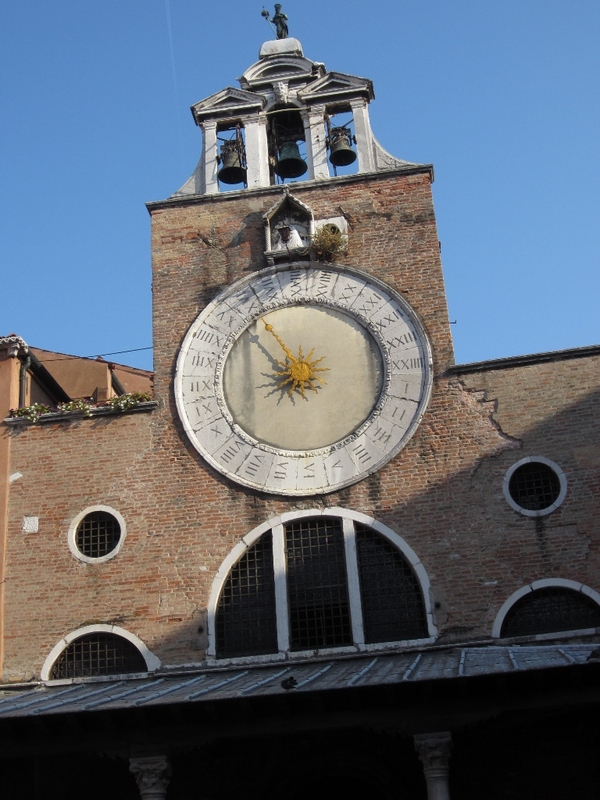 We saw several clocks like this one in Venice. A 24-hour clock, but notice that 1 doesn’t start in the same place as a traditional clock. Our back streets of Venice tour guide explained to us that the 1 was placed where most locals started their day, which on this clock looks like 4 or 5 in the morning and then progressed around from there. I also saw a similar clock inside the Doge’s Palace that showed what sign of the zodiac we were currently in. Fascinating. I took pictures of a lot of boats on this trip, mostly for my sailboat captain husband (I also wrote down the type of each airplane I flew in for the same reason). 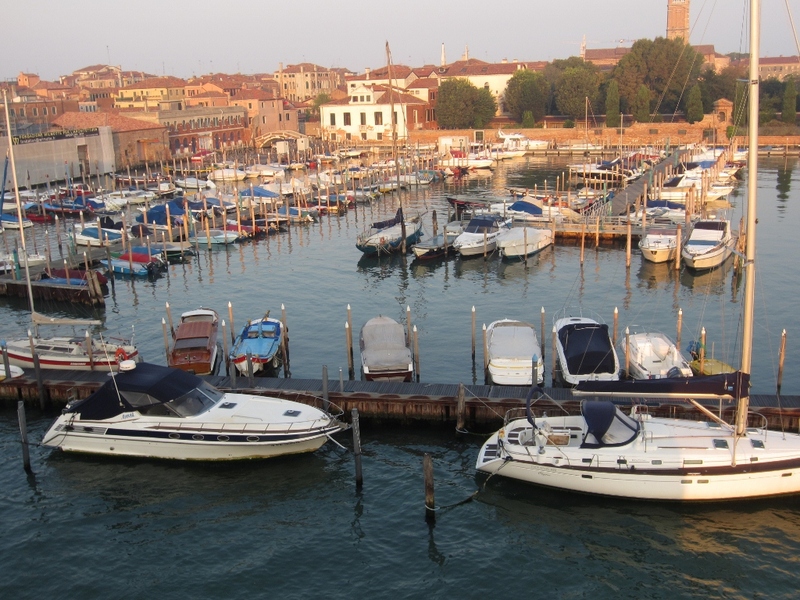 The brown wooden boat in the middle of the photo below is a typical taxi in Venice. Venice was also interesting because it had no cars, and therefore, no delivery trucks, so we realized that for every store that contained merchandise, those wares must have come on a very convoluted journey. 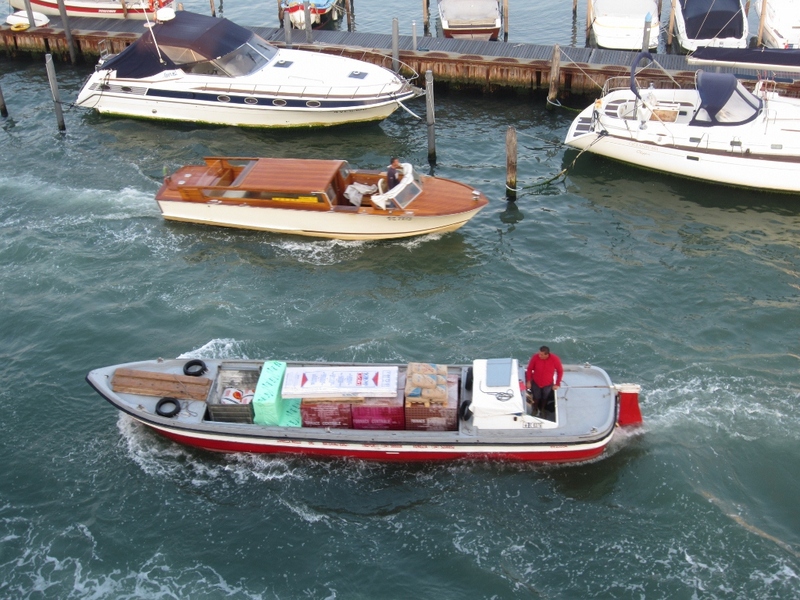 Goods could be trucked to the mainland, but then must come via boat to Venice and I saw many boats like this one carrying various loads. This one had building materials, some were entirely bottled water, others were refrigerated dairy products. But unless the destination store was on a canal, the goods had to be hand carried in a wooden cart to the store front. One evening while we sat in a cafe eating grilled octopus and drinking pinot grigio, we watched a public market full of goods be dismantled by hand, tents, display tables, and all, and then hauled off by hand on specialized metal carts, which would return the next morning to be set up again in the same spot. Garbage was also curious in Venice. They haven’t the space to leave out a large can like I do at home in the alley, so Venetians put their garbage out each morning before 8 (or the night before), and a person comes by daily to collect the garbage. Recycling is collected on specified days. This garbage barge then wove through canals collecting the parcels. I took a photo of this one because of the persian rug on the front. I was frequently reminded how much I missed my little boys while I was away by sites like this one. 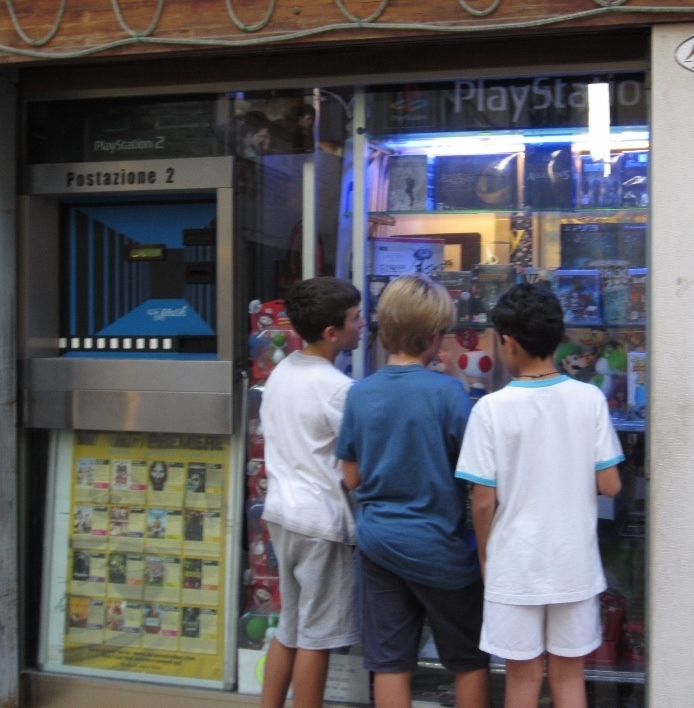 Apparently, Italian boys aren’t so much different from my boys at home. Stucco work was being done on the neighboring building next to our apartment in Venice. The workers caught us watching them more than once from our balcony. When they caught us staring, some were flattered, but their boss looked perturbed and simply said, “Prego.” I understood prego to mean, “you’re welcome”, but later discovered that it has many meanings in Italian. It can mean what can I get you?, please come in, please take a seat, please go ahead of me (if you’re holding a door open), I also heard it used as a response to me saying excuse me when I bumped into someone, as in, no problem. It would make sense that the construction boss would say you’re welcome to me in the context of, “you should say thank you for all this free eye candy so I’ll just skip to you’re welcome,” but I think he meant, “can I help you?” The language barrier got in the way here or there, but in this case, I understood his meaning simply from his inflection and demeanor. We also had a little misunderstanding the night of Ken’s 40th birthday. I stopped by the restaurant at which we had a reservation later that evening. I wanted to clarify that we’d like to sit a fuori, outside, because it was a special birthday. But the waiter thought I said that I was requesting fiori or flowers for a special birthday. When I made the request, the waiter looked troubled, then went to the owner and relayed the request. She looked annoyed and then said in a very dismissive manner that there was no way she could provide flowers for the party on such short notice. Luckily I understood enough italian to realize the misunderstanding. She must have thought we were some pretty high maintenance Americans. The waiter was so relieved when I clarified. Later the next day I witnessed our stucco worker friends dumping a full bucket of construction waste into the channel. It made me realize that Venice must have storm water management problems above and beyond most places in the U.S. Here, construction workers can dump a bucket on the ground and it will percolate through the yard soil before draining to a nearby stream or storm drain, but in Venice, most things must wash right into the canal. 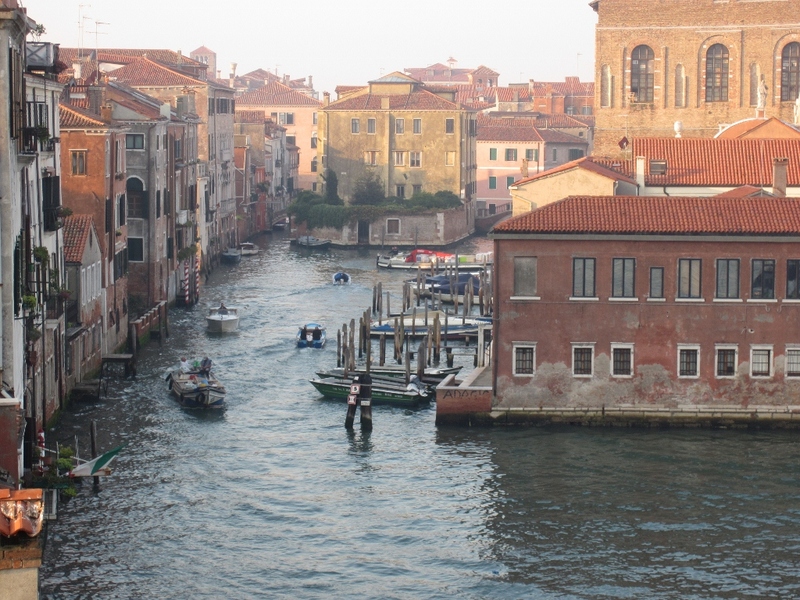 Most canals in Venice are not deep, mostly less than 15 feet in depth. 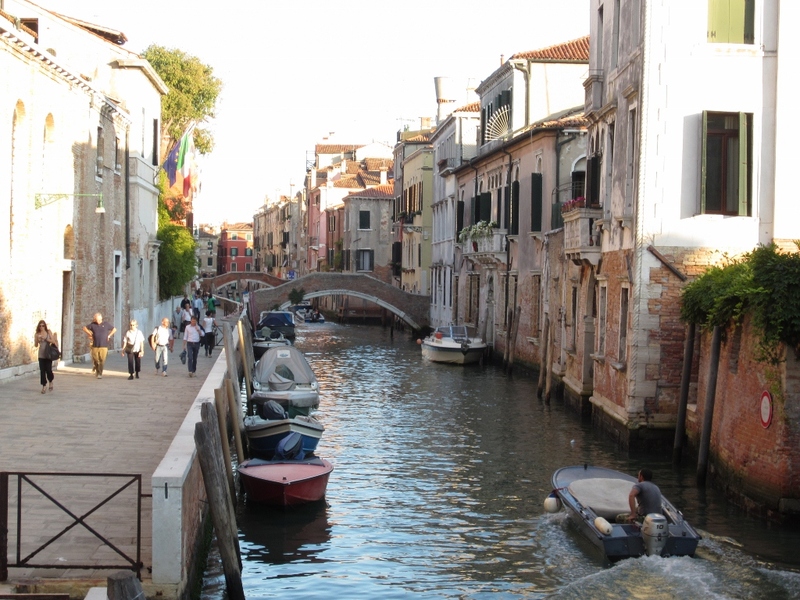 Our back streets tour guide pointed out that Venetians rely heavily on tidal flow to flush out the canals, to move waste out into the sea, and to bring in fresh water. I can only assume that water quality, and the availability of clean fresh water, must be an ongoing concern in Venice. 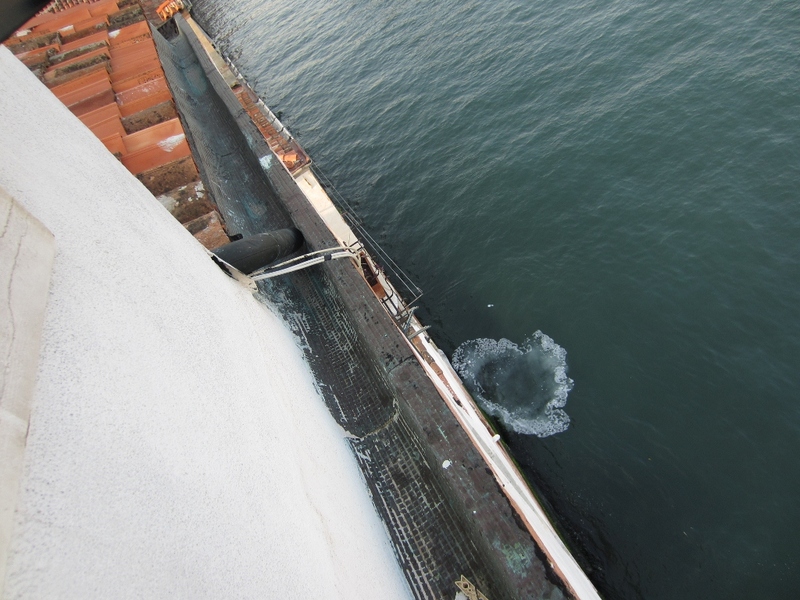 Here is that bucket of waste 30 minutes after he dumped it in the channel. I had the most laughs in Venice, and in each of the cities we visited, just sitting in cafe’s and bars with my traveling companions. 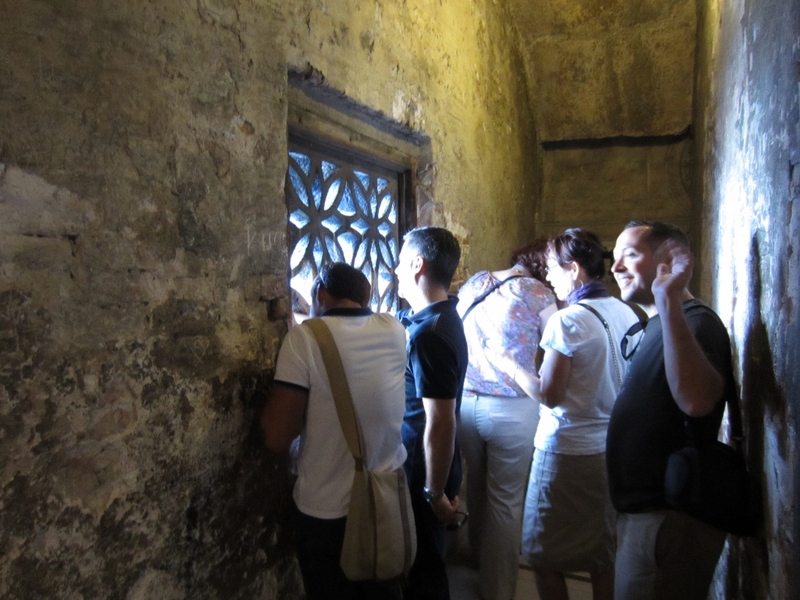 We met other tourists and some italians while practicing our language skills with waiters and servers. 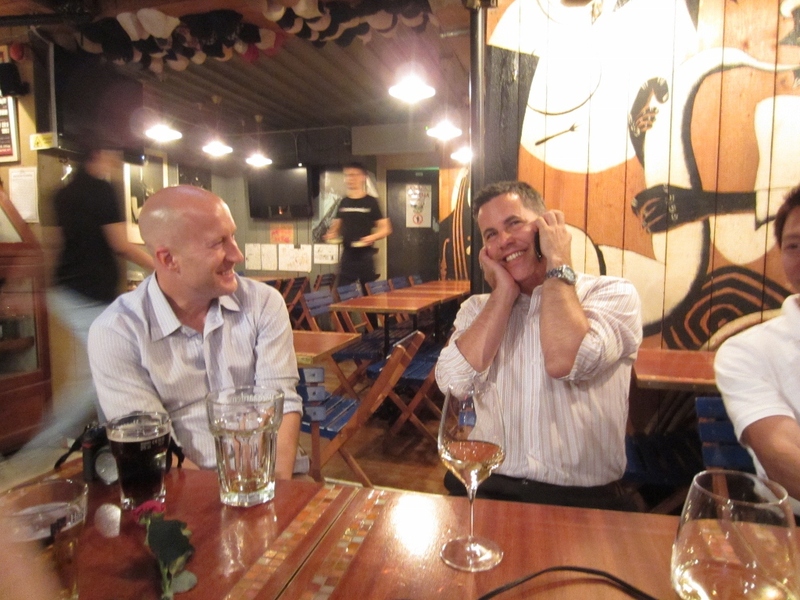 One of our favorite places in Venice was The Jazz Bar. They had giant beers, being toasted below by Scott and Jenny. The walls were decorated with Jazz greats like Billie Holiday and Dizzy Gillespie, while music videos by Mariah Carey and Beyoncé played in the background. We also never figured out what a ceiling covered with padded bra’s had to do with Jazz either, but it didn’t keep us from coming back three nights in a row. One evening Ken prank called one of Jenny’s coworkers in the U.S. and we all had a good laugh. We never tired of hanging out in pubs and outdoor cafe’s, people watching and laughing at each days events. Although we only rode the train through Pisa, the only leaning tower we saw was this one in Venice. 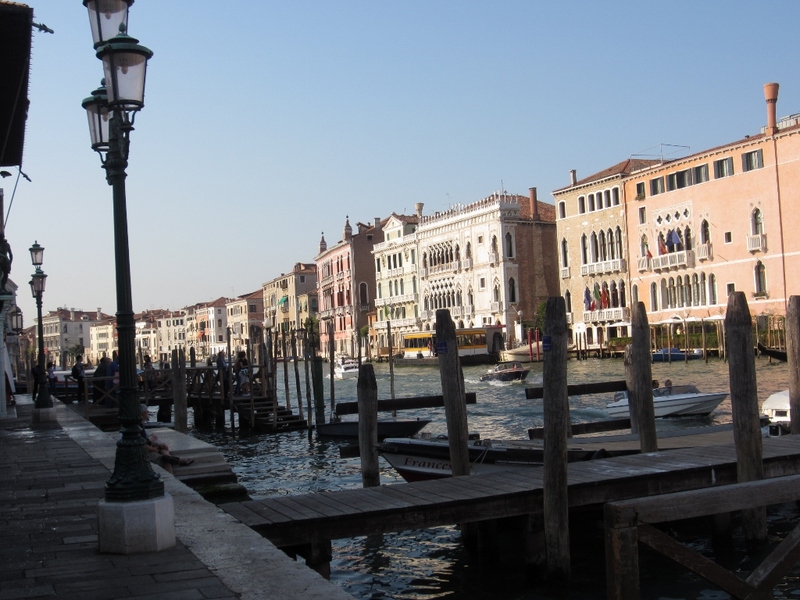 Venice was built centuries ago in a salt marsh and is supported on wooden posts driven into the marsh clay. Over time, that wood has become petrified and quite solid, but it is slowly sinking nonetheless. 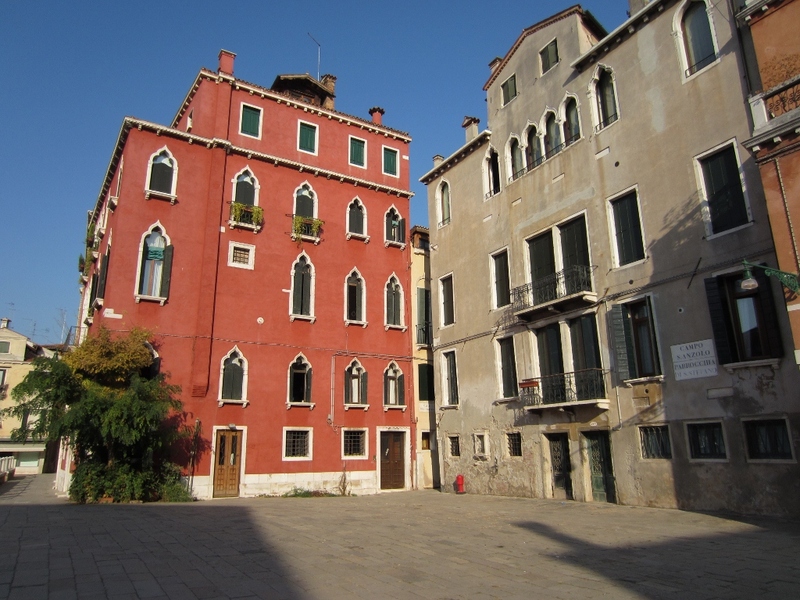 Most buildings in Venice struggle with uneven settling, and many of Venice’s towers have had to have their foundations repaired, and many towers rebuilt over the years. This one leans a lot when you really look at it. 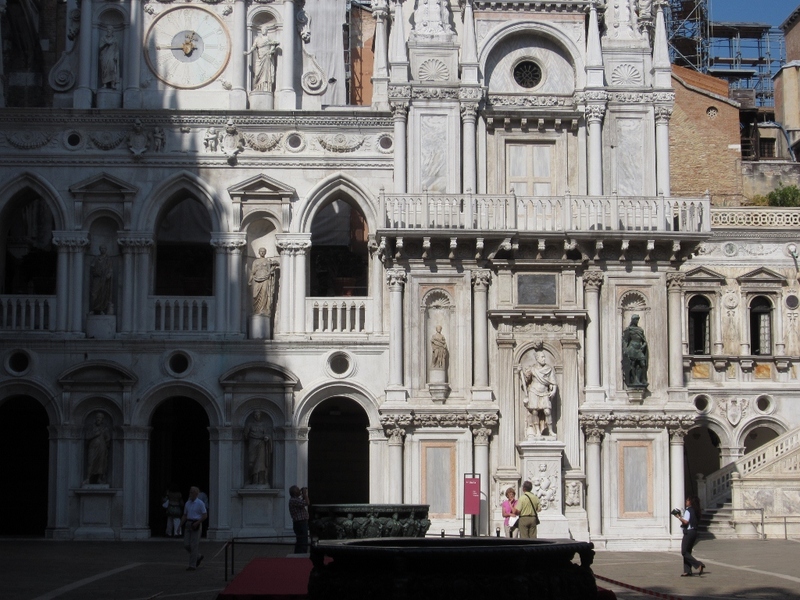 Although we weren’t allowed to take pictures, we also visited a famous church in Venice, called the Church of the Friars, that contained Renaissance art by Donatello, Titian, and many others. Tomorrow, I’ll write about the second city in our tour, beautiful Florence, Italy. 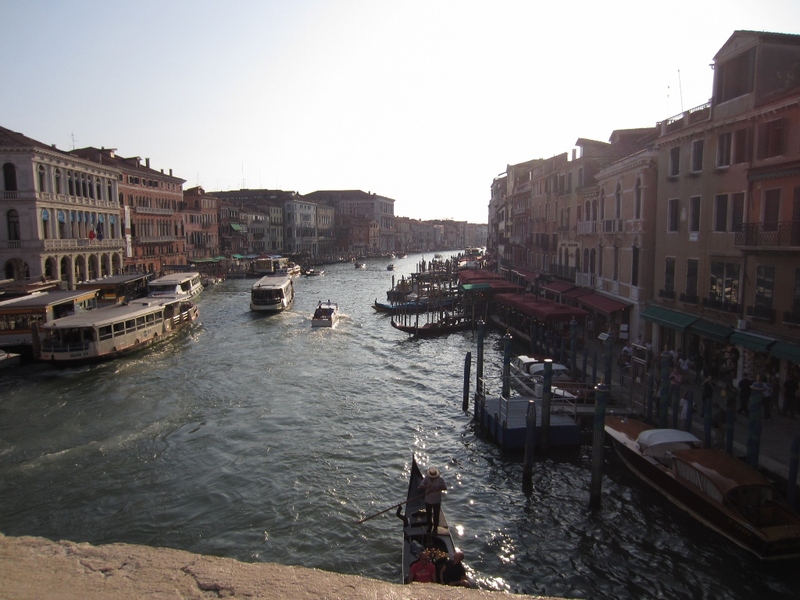 The Grand Canal is like I-5 on the west coast, the major thoroughfare that cuts through Venice. Lined by big hotels, restaurants, and shops, there is beauty in every direction. 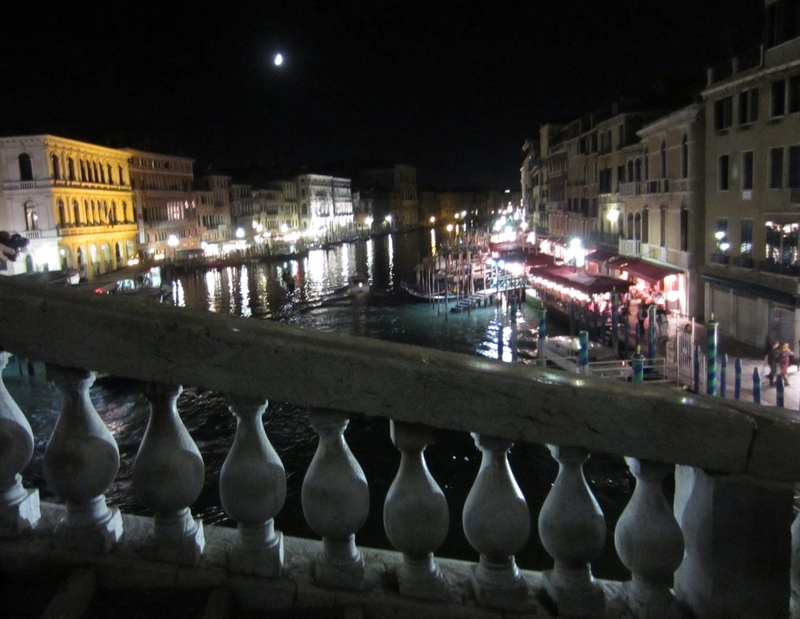 One of the more romantic spots in Venice is a major crossing point over the Grand Canal, the Rialto Bridge. A tradition that I was not able to take advantage of is to kiss your sweetie on the bridge. With this view, I sure felt like kissing someone, but my hubby was 6000 miles away so the photo had to be enough. The 3/4 moon was the icing on the evening. 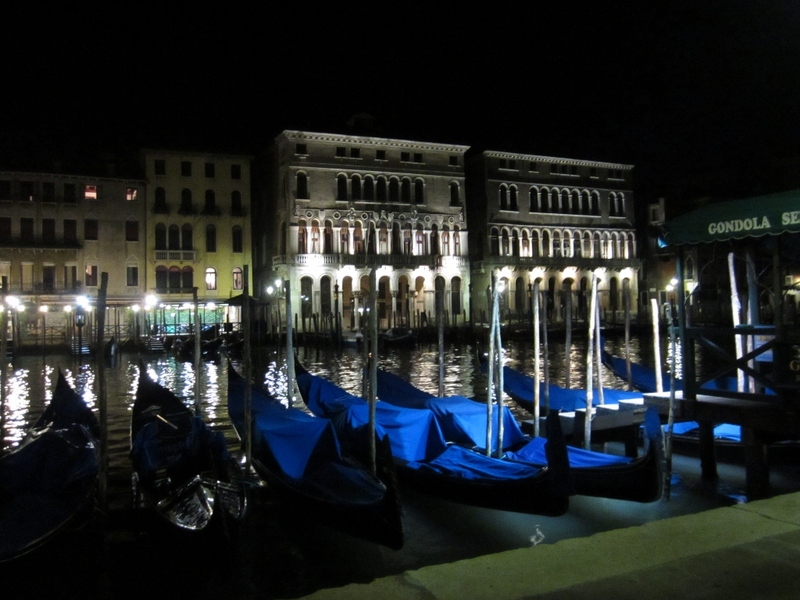 Venice at night was what made me fall in love with the city. Below are the gondola when not in use. I loved the glow of the lighting along the canal at night. We walked and walked and it was even prettier with my white wine buzz. 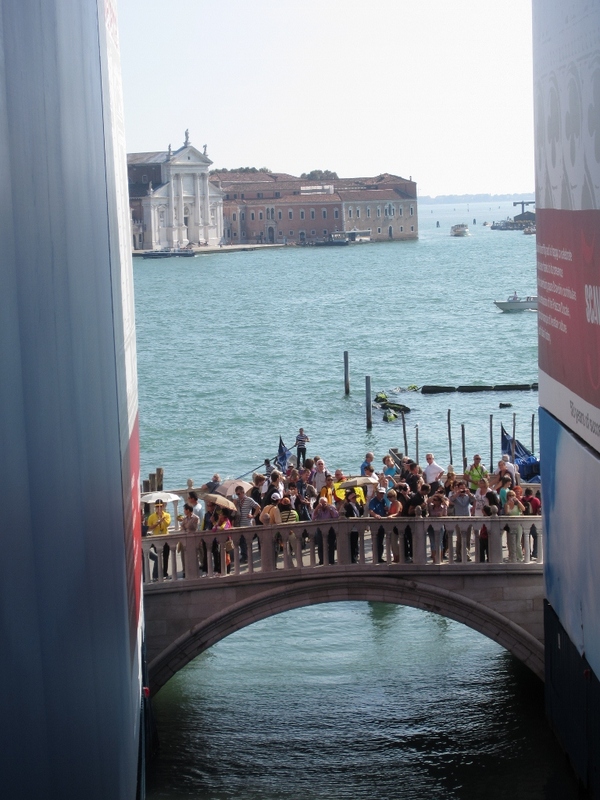 The vaporetto docking was crude (shown at left in the photo below). Waiting passengers would stand in the little “box” at the end of a dock and the vaporetto would pull up quick, slamming into the dock. 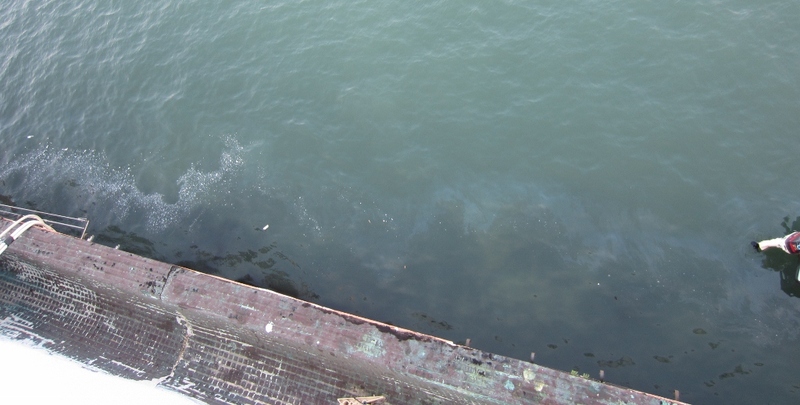 An attendant would throw a rope over a large cleat on the dock, slide open a 4-foot door, bodies would crush off and bodies would crush on, and within about 3 minutes, the door slid shut and the vaporetto was on its way. Done. I was amazed at how quickly italian seniors could move compared to those loading a bus at home. I guess it keeps you spry. We had trouble at first figuring out how to buy vaporetto tickets, since there was no ticket dispensary on the dock. By our third try, we discovered that you could buy tickets at the nearest news stand, but of course there was no sign saying so, we just found out from a kind italian waiting for the next vaporetto while we all pondered aloud how we’d ever get tickets. I’m embarrassed to say we took to vaporetto rides for free until we figured it out. It made me wonder how hard it must be for tourists here in the U.S. to figure out our bus system. We got some great views of the Grand Canal when we took a “back streets” tour of Venice, the only paid tour we took in our two-week trip. I loved the tour and the great people we met. Our guide answered all my odd ball questions about city planning, geology of the building materials, and idiosyncracies of italian like what’s the difference between per piachere and per favore, which both mean please. 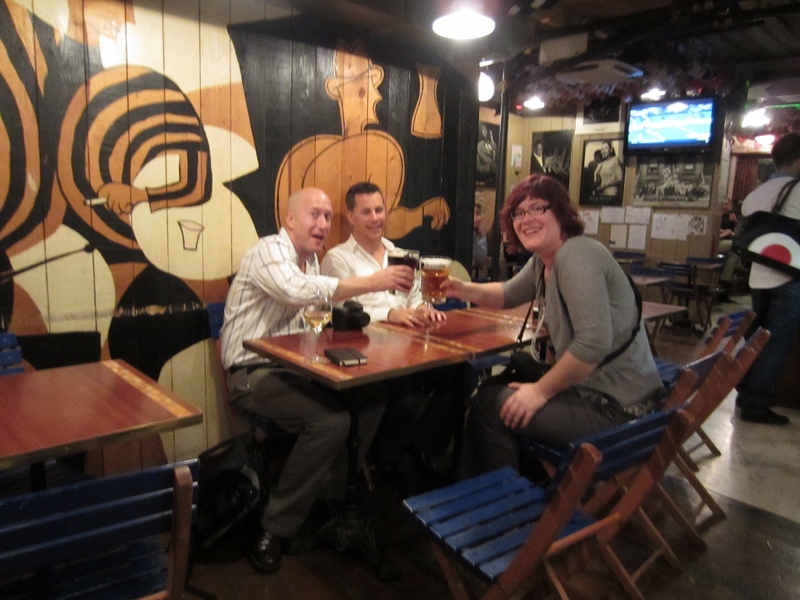 After our back streets tour, we did a pub crawl off the main track. Whenever we took a group photo, we would shout, “formaggio” instead of cheese. 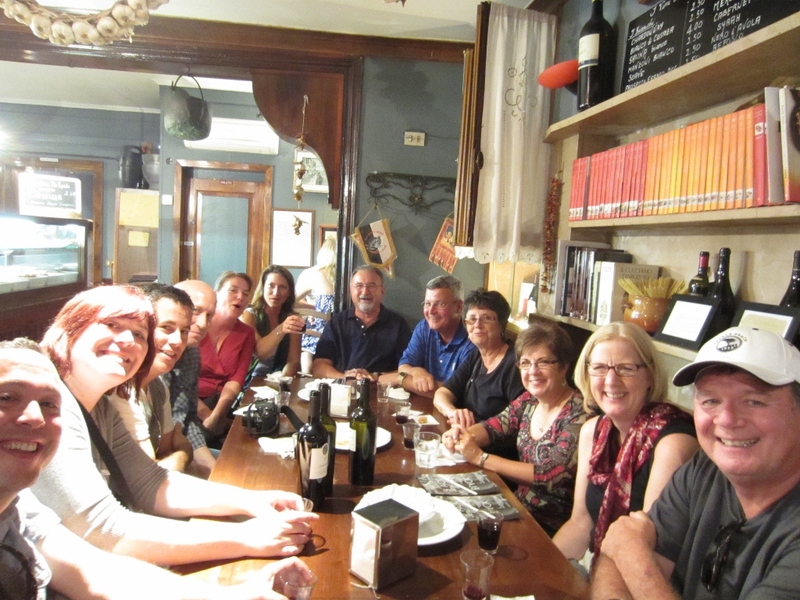 We met the lovely Dona from Santa Cruz and had dinner together while she gave us pointers about what to see and do in Cinque Terre. I marveled at the architecture and beauty of the buildings that lined the canal, first built by Venice’s wealthiest families, and now converted primarily to businesses and restaurants. 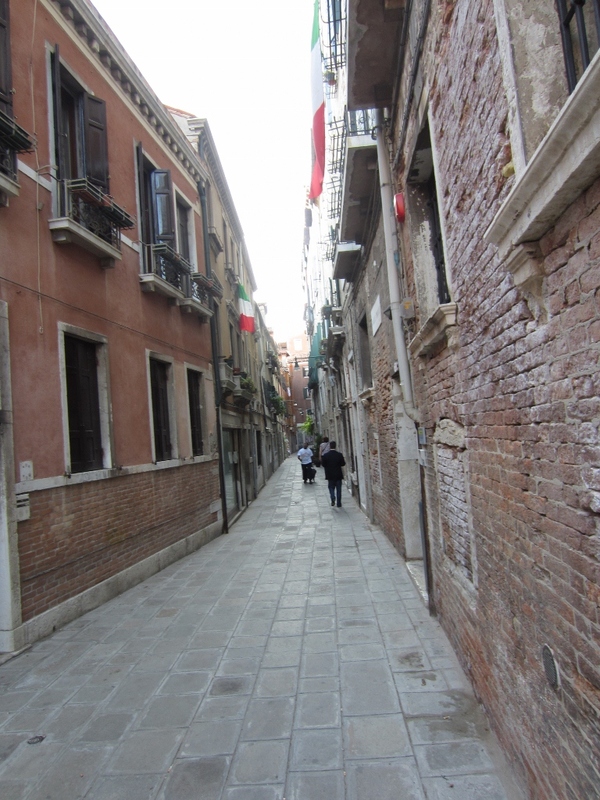 Our guide mentioned that change is difficult in Venice because there are many laws and ordinances designed to maintain the historic nature of the city. Exteriors can rarely be changed, and even the structure of interiors are highly scrutinized to maintain original artwork and architecture. We also spent a lovely day at the Biennale, a national art exhibition that is held in Venice every other year, where each country chooses one or two artists to represent them at the show. I loved seeing the range of art, from photography, sculpture, painting, digital cartoons, and film to a range of exhibits that I didn’t even know what to call (other than ‘mixed media’). Some were religious, political, or romantic, while others went for provocative or modern or contemporary. Several exhibits were about U.S. film and politics, even though they were produced by other countries. I was fascinated by how other countries viewed and judged the U.S.in their work, it’s culture and public figures, and the fact that of all the art produced in their country, the work about the U.S. was chosen for the exhibition. The piece above was along the Grand Canal and was one of the most interesting pieces I saw. 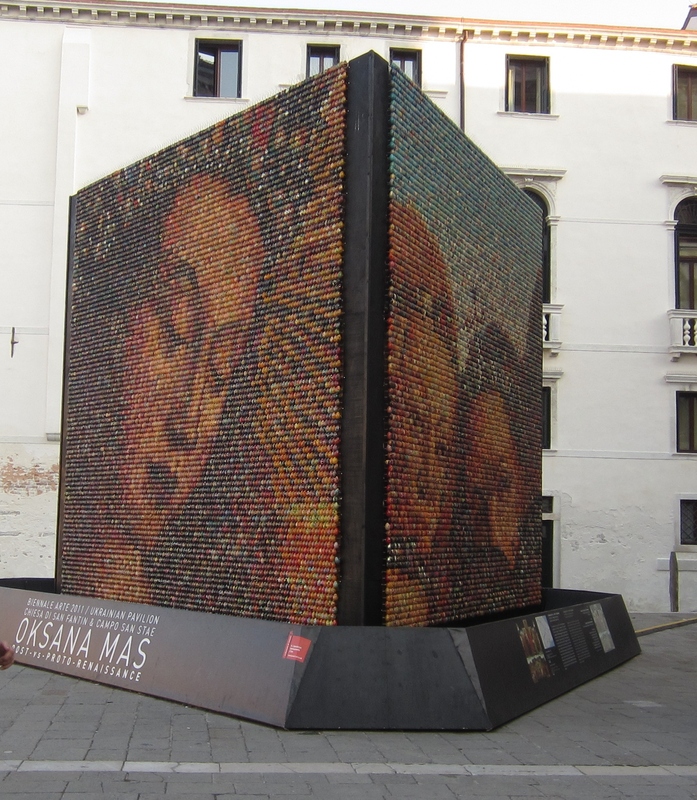 Each “pixel” in this piece is a hand-painted egg. Literally. I’m blown away by the originality, the sheer time that must have been invested, and the execution of the concept. By the end of this day, I wanted to take an art class just to learn the vocabulary to describe all that I saw. Big thanks to Scott who organized the trip for exposing us to such interesting and stimulating work. Tomorrow I’ll write about the last tidbits of Venice before moving forward to the second city of our tour, the historic and impressive Firenzia (Florence). I love comments so don’t be afraid to leave them! 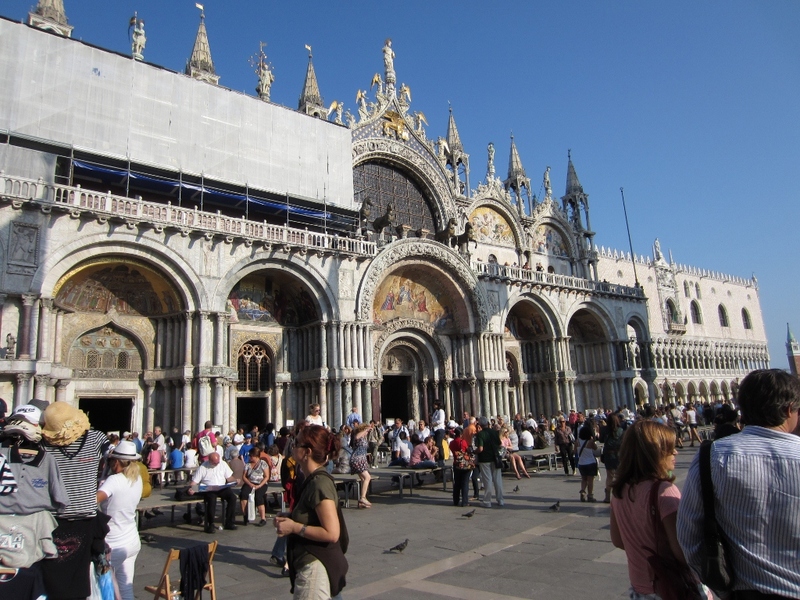 One of the sites in Venice that stuck with me was the Basilica of San Marco (St. Mark’s) and it’s piazza (square). It’s an icon for the city and features embellishments pillaged from other cities. It was the most crowded destination and unfortunately we didn’t make it inside but the exterior was an ornate masterpiece. My travel companions stopped to pose for what has become my favorite photo of the trip. Scott, Jenny, Ken, Rupert, and Anthony were a joy to travel with. Thanks to them, I laughed until my stomach hurt every day. They were a considerate and wise bunch and I’m glad I got to share one of the most exciting times of my life with each of them. The square was full of pigeons and the tourists enjoyed letting them sit on their arms and feeding them, but we saw them more like rats so we laughed when a tourist was covered in them for photo ops. 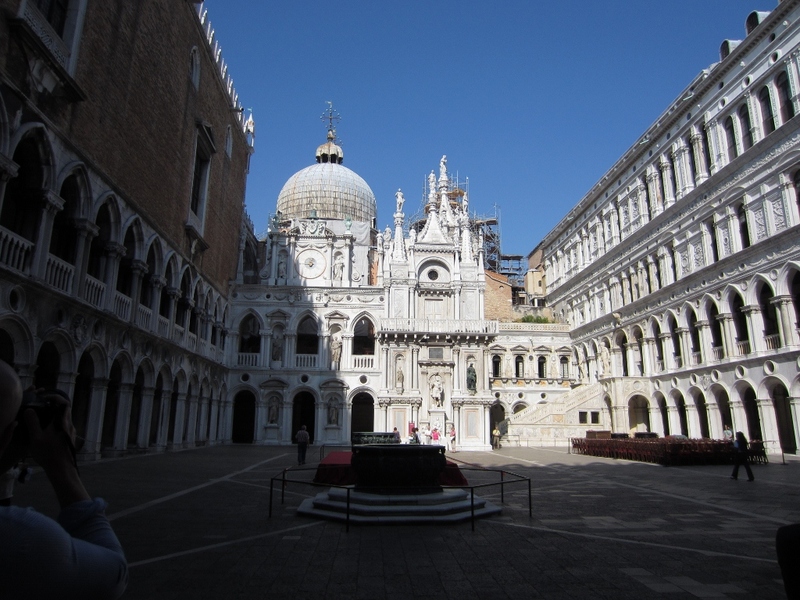 The Doge’s Palace, the home of the Doge or supreme authority of the Republic of Venice, was originally constructed in the 1300-1400’s in the gothic style. In addition to a residence, it also served as a government meeting place for the Republic until Napoleon arrived in 1797. Photos were not allowed inside the Palace, but this central courtyard gives you an idea of our ornate and grand the decor was. I’ve never seen more life-size statues. 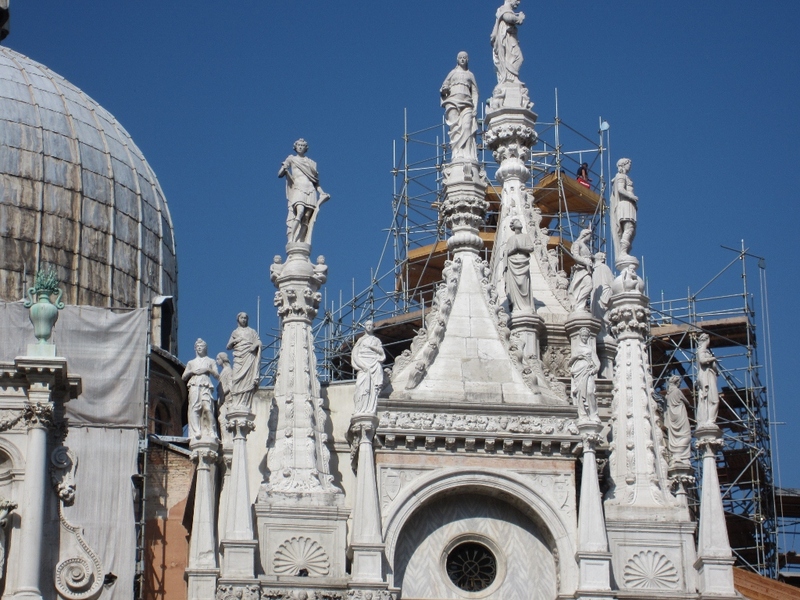 Some part of most major sites in Venice are in the process of restoration or maintenance. The scale and difficulty are shown in this photo of scaffolding around just one peak of the building. If you look close, you can see a person on the scaffolding. Whenever I visited a site like this palace, I tried to imagine the Venetians physically constructing it without cranes, electricity, or any modern invention. The sheer number of humans and time invested must have been staggering. 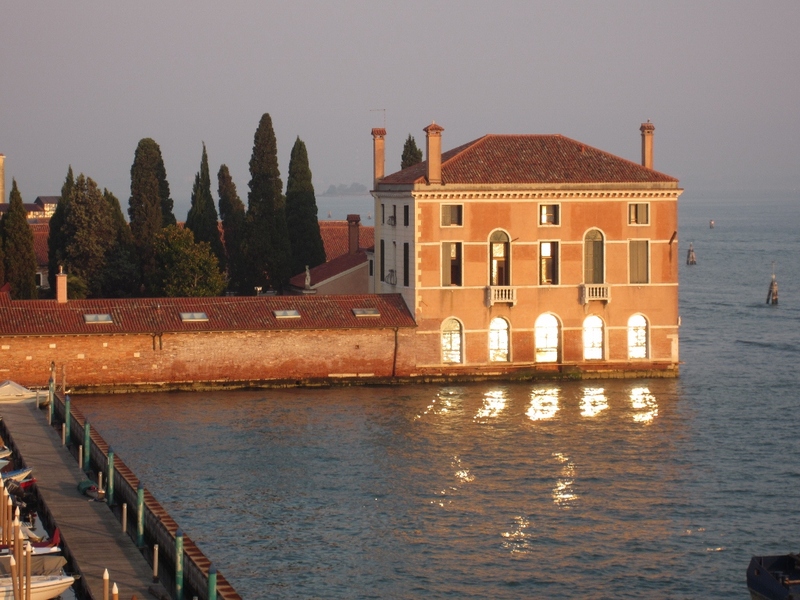 The palace also originally contained the court and prison of Venice and once housed the infamous Casanova. Later a prison was constructed next to the palace and was connected by the Bridge of Sighs, named by Lord Byron because the bridge offered prisoners their last view of Venice, and their last sigh at its beauty, before descending into their imprisonment. Anthony waves to me while my other companions take in the prisoners final view of Venice, the view shown below. This view from the Bridge of Sighs includes a peak at the island of San Giorgio Maggiore and its church dedicated to St. George, shown below, and now housing a famous library and art gallery. We didn’t make it out to this island, but it’s just one of many attractions on my list of excuses to return to Venice someday. 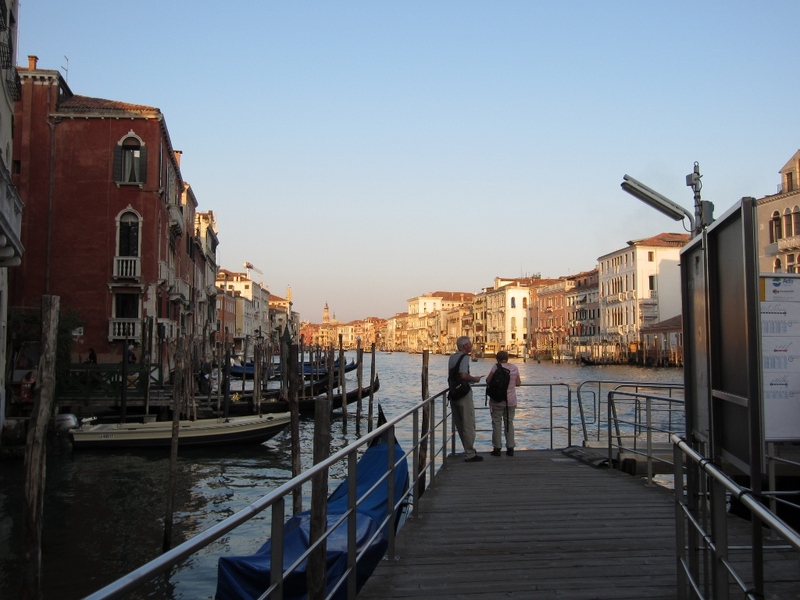 Tomorrow I’ll share photos and stories of Venice’s main thoroughfare, the Grand Canal. One of the reasons Venice was one of my favorite cities in Italy is because everywhere you look, there are beautiful, rustic buildings in warm, rich colors, each sitting in front of a scenic canal or pedestrian-only street (calle), post-card ready. The hundreds of stone arch bridges that span the small canals reminded me of the lovely covered bridges of the midwest: not merely a causeway, but each a work of art and no two exactly alike. Venice is a city for photographers. I could have taken a new photo every 50-feet of the trip, and practically did at first before I realized we’d never make it to any destination at that pace. I was reminded of my first Northern British Columbia kayaking trip in the 1990’s. At the trip’s start, each time we saw a bald eagle, everyone would point and shout, “bald eagle!” By the end of the two-week trip, bald eagles felt as common as crows and we instead would say sarcastically, “oh, look, another bald eagle.” Although I wasn’t in Venice long enough to see a new canal and think, “just another bald eagle,” I eventually did stop taking pictures of every one we passed. 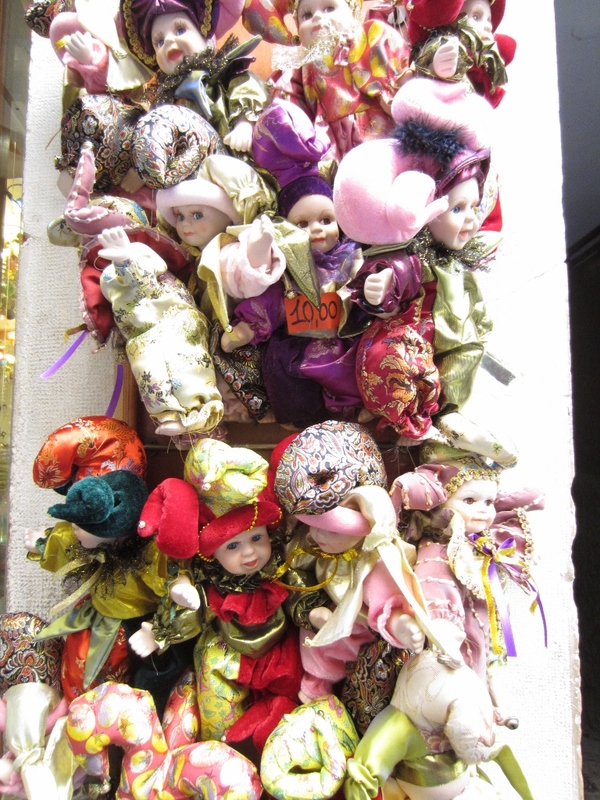 The masks that were for sale in tourist shops, and this oddly Chuckie-esque display of dolls (their eyes followed me!) reminded me of Venice’s history as the original home of Carnivale, an annual festival held in Venice that starts 40 days before easter and ends on Fat Tuesday or Mardi Gras (Martedi Grasso), the day before Ash Wednesday. Mardi Gras as celebrated in New Orleans and the practice of eating richer, fatty foods before the ritual fasting of Lent, which begins on Ash Wednesday, is based on this event. The masks that were traditionally worn to hide any form of identity between social classes have become a major tourist item in Venetian shops. 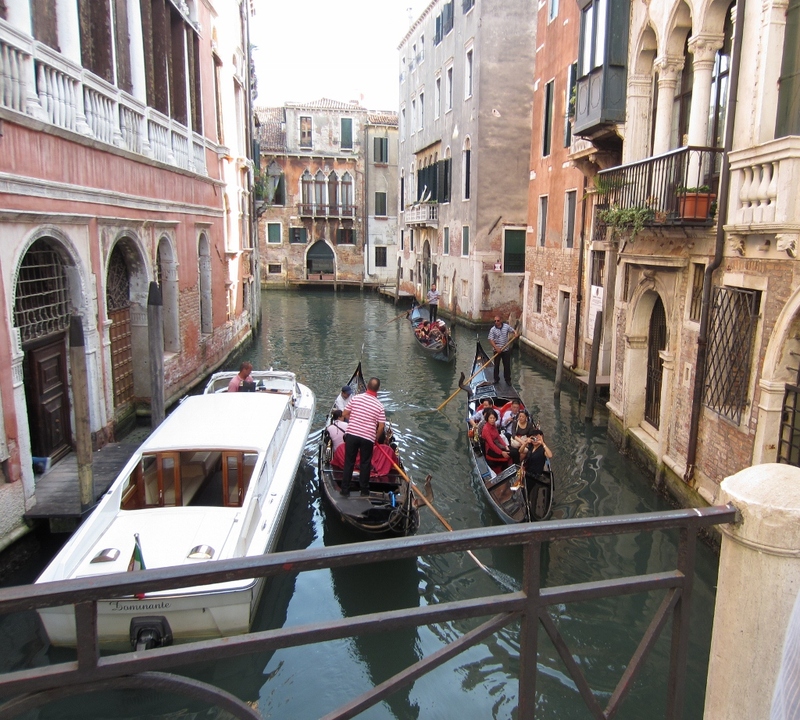 Of course, Venice would be what it is without gondola rides. Our group didn’t choose to take one, but we saw others enjoying them all day long in the little canals. We were told a ride could cost around $80 U.S., and for an extra $80 you could add an accordion player and singer. These two gondoliers exchanged heated words in italian about communication and turn taking as they passed under the bridge. 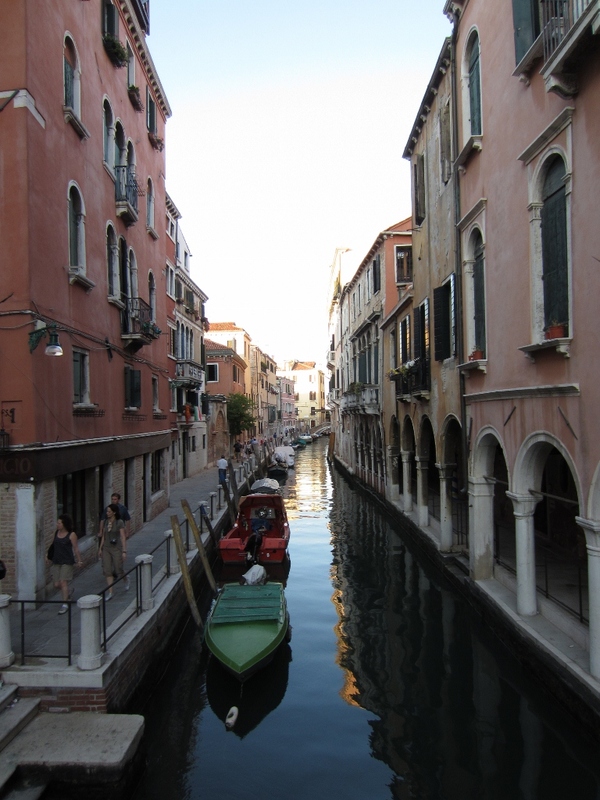 The gondoliers have a precise etiquette among them, that involves calling out as they approach bridges and corners to avoid collisions in these tight spaces. The boats are very special in that the hull is not symmetrical, so they can be paddled with an oar on only one side. Because of their unique design, they reportedly cost more than $15,000. Before going on the trip I watched a documentary about how difficult it is to become a gondolier, a secure and coveted profession in Venice. Tomorrow I’ll write about the day we spent exploring La Piazza de San Marco (St. Mark’s Square) and the Doge’s Palace of Venice. I had such a great vacation in Italy that I thought I’d share it here. I don’t have any pictures of the interior of the third-floor apartment we rented in Venice, so you’ll just have to take my word for it that it was pretty amazing. 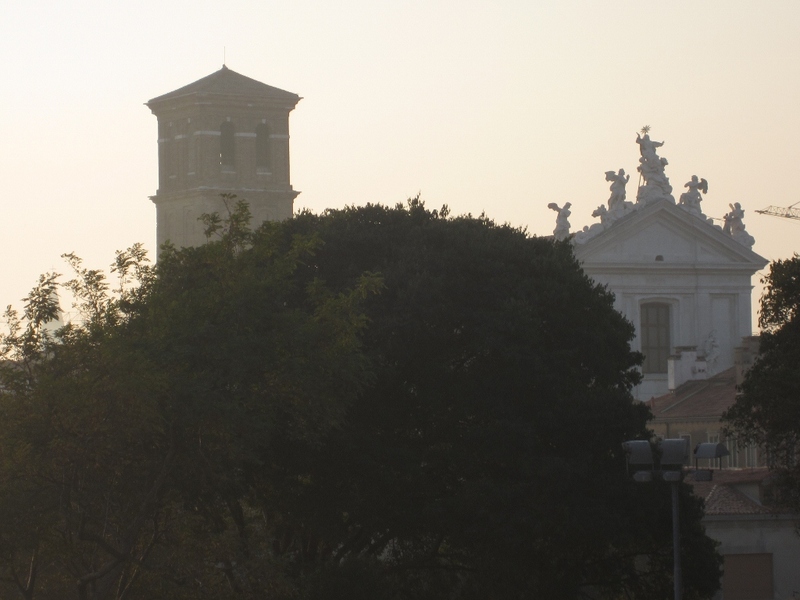 It was located near the corner of Sestier de Canaregio and Parochia del SS. Apostoli in the Fondamente Nove Neighborhood. From our bedroom window, we could see the island of Murano, the island where most glassblowing in Venice was relocated to in order to avoid uncontrollable fires. 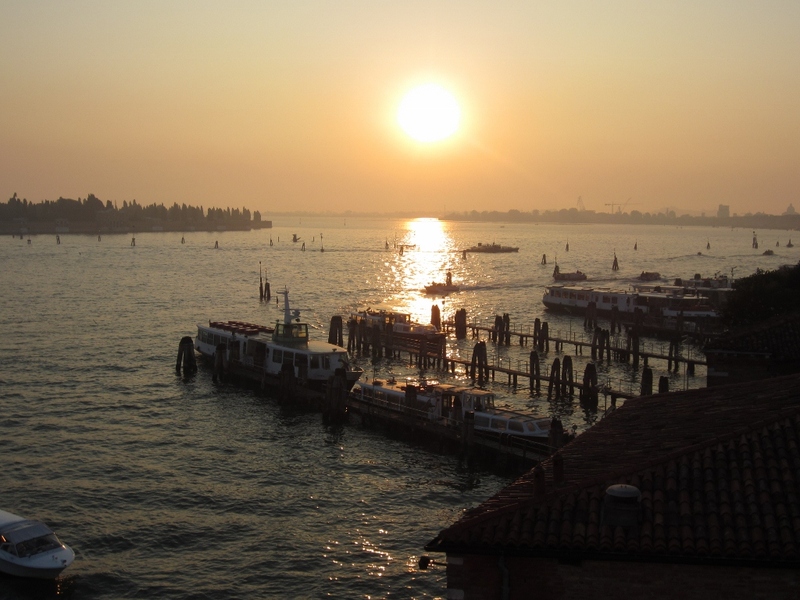 Murano is in the distance on the left in the photo below of my first Venetian sunrise below. I had trouble sleeping the first couple of days because of the excitement and the nine-hour time difference. I shared the purple room with the lovely Jenny from Seattle. The 360 view out the rest of our windows was overwhelming. All of us spent a lot of time in the morning just leaning out the windows, breathing in the moist salt air, and soaking up the sites. Outside our bathroom window was a quiet marina. On the edge of the marina was a beautiful building that reflected the morning sunrise in the windows. I geeked out and took too many pictures of this building every morning. The trees in the photo below were common in Italy and this photo in particular reminds me of a Monet painting. Also out our bedroom window was this interesting building. I loved waking up to the silhouettes of the statues. I’m assuming it’s a chiesa or church, although I never actually walked over to check it out. Just in front of it, I could hear children playing at the nearby school. of most buildings. 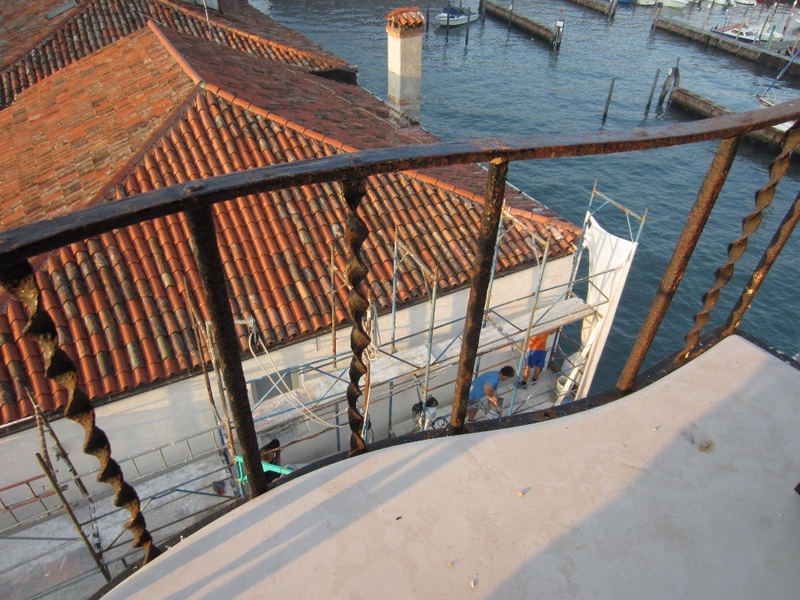 Venice is a city in constant repair. With views like these, it’s a wonder we ever left our room. 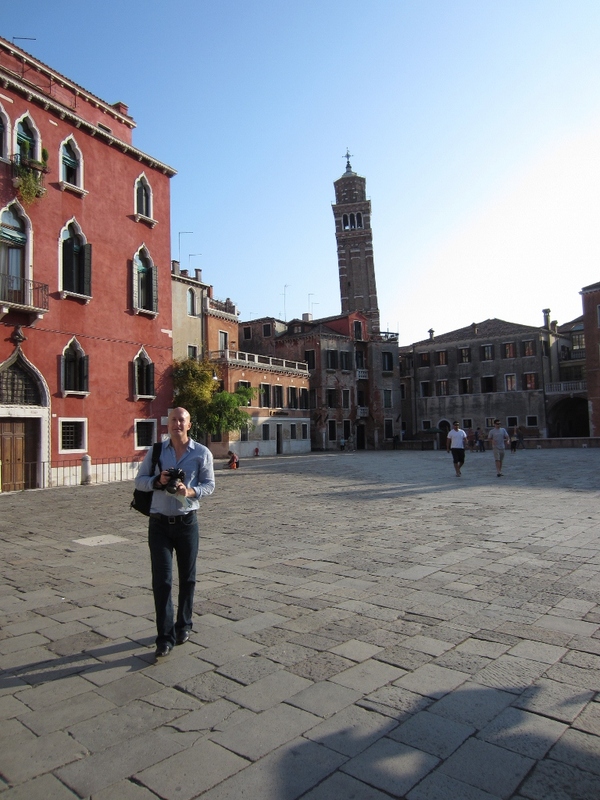 But of course we had many memorable adventures wandering through the unforgettable Venezia. Tomorrow I’ll share some more photos and a story or two of my favorite city in our trip.